The Michigan Association of Railroad Passengers (MARP) will be having its monthly membership meeting at Durand Union Station 200 Railroad Street, Durand MI, 48439, on Saturday, May 16, 2015. The meeting will start at 10 a.m. in the second floor Ballroom at the station. 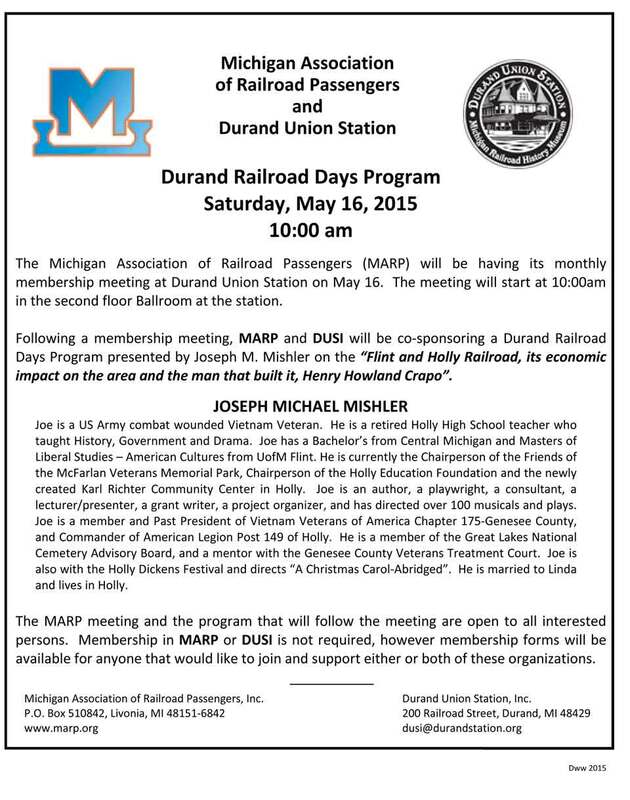 Following a membership meeting, MARP and DUSI will be co-sponsoring a Durand Railroad Days Program presented by Joseph M. Mishler on the “Flint and Holly Railroad, its economic impact on the area and the man that built it, Henry Howland Crapo”. The MARP meeting and the program that will follow the meeting are open to all interested persons. Membership in MARP or DUSI is not required, however membership forms will be available for anyone that would like to join and support either or both of these organizations.